Khenpo of Dzogchen Shri Singha Monastic University in Tibet. Recognized as the reincarnation of the great Buddhist scholar Gedun Chopel Rinpoche. Student of Khenchen Pema Tsewang Rinpoche, and Khenpos Chatral Chochyab Rinpoche and Kunub Ozer Rinpoche. Lineage holder of Sutra, Tantra, and Dzogchen Khadro Nyingthik and Longchen Nyingthik lineages. Received the degree of Khenpo at the age of 22, an unprecedentedly early age in the history of Dzogchen Shri Singha University. 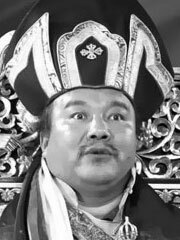 One of the first of the first new generation of young scholars to emerge from Tibet following the formal revival of Buddhist education there in the early 80’s. Current spiritual leader of the Dzogchen Shri Singha International organization, and many affiliated Sanghas internationally.